The Fifty Fathoms has enthralled divers worldwide for over 60 years. 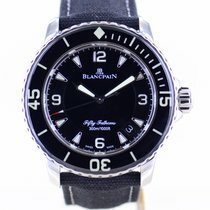 Blancpain originally developed the watch at the request of the French marines. The Swiss manufacturer remains an outstanding example of how fine watchmaking can help shape history. The Fifty Fathoms is named after the fathom unit of measurement used for determining water depth. In the past, sailors measured the depth of water under their keel using a sounding line. They would cast the line with a lead weight at the end and after pulling the line back up, the sailors could measure depth based on fathoms. One fathom is equal to the average male armspan - about six feet. The maximum depth sailors could measure with this method was 300 feet, or 50 fathoms. At the start of the 1950s, the French marines needed a watch that could function at that depth. 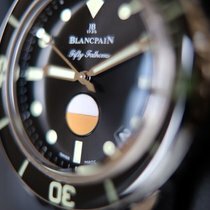 By 1953, Blancpain had managed to develop such a watch - and thus, the Fifty Fathoms was introduced to the world. Jehan-Jacques Blancpain founded the company in 1735, and today they celebrate over 280 successful years of watchmaking experience. Blancpain put the first automatic wristwatch on the market in 1926. They are also the creators of the Grande Complication 1735, which is considered one of the most complex wristwatches of all time. It is an automatic watch featuring a tourbillon, minute repeater, split-second chronograph, and perpetual calendar, among other complications. Robert Maloubier and Claude Riffaud, two French combat divers, required especially robust watches for timing dives and navigating underwater. It was essential for these watches to function perfectly while they were deep underwater. After multiple companies had refused the offer, Blancpain took on the task to develop the watch. The then-director, Jean-Jacques Fiechter, was himself an ardent diver and is considered the father of the Fifty Fathoms. The bezel can only be turned counterclockwise, a first in the history of watchmaking. This specialization improved dive safety and established itself as a standard in diving watches. If the diver accidentally moves the bezel, the dive time can only become shorter, not longer. The numbers and indexes on the dial and bezel clearly stand out from the black background and have six layers of SuperLuminova. The case of the first Fifty Fathoms from 1953 measured 42 mm. It was large enough to attract the attention of audiences during screenings of the documentary film The Silent World by French oceanographer Jacques Cousteau. The newer stainless steel models are a bit larger, with a diameter of 45 mm and a thickness of 15.5 mm. 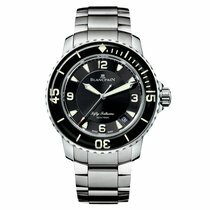 Blancpain introduced a new edition of the watch in 1999 with improved water resistance. The Fifty Fathoms can now function perfectly up to 30 bar. The automatic caliber 1315, introduced in 2007, powers the watch. It's based on the manually wound movement 13R0, in use since 2006. Similar to the 1315, the 13R0 is only found in Blancpain watches. The 1315 is 5.65 mm thick and has a diameter of 30.6 mm, with a power reserve of up to 120 hours. Unlike the classic stainless steel Fifty Fathoms, the Fifty Fathoms Bathyscaphe's case is made of satin-brushed black ceramic, a lightweight and especially scratch-resistant material. Like the other models, the band is made of sail-canvas with a reverse side made of rubber. The clasp is also made of satin-brushed ceramic, which coordinates nicely with the case. The indexes and numbers on the bezel are made from Liquidmetal, a modern, hardy, glass-like metal alloy. All of the watches in the Fifty Fathoms line are symbols of robustness and longevity. A classic example of a Blancpain watch is the Villeret, named after the town where the company was founded. The outer design of the watch exudes classic elegance in the traditional Blancpain style. It's set apart by its Grand Feu enamel dials and serpentine hands made from blued steel. The Léman takes its name from the French name for Lake Geneva, "lac Léman." 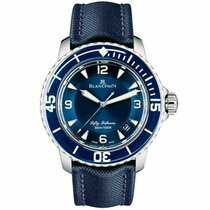 This watch mixes classic Blancpain features, such as a round double-stepped case, with modernized dials and bands. Thanks to its complications, it is an ideal watch for travelers. Many of the models in this series feature an alarm and the ability to set a second time zone.